Lucia has an intelligent script, audacious screenplay and boasts of technical brilliance that you just cannot ignore. The idea behind the simple story is radical. The way the script handles issues that cut across various subjects has to be lauded. The narration is a roller coaster ride with multiple layers and it takes a while for the entire premise of the movie to sink in. If you thought you have had the hang of it, you might have to wait till the climax to prove yourself right. Lucia garners attention almost throughout the movie; you are so much swept away by the execution, spoofs, wit and the music that you have little time to wonder the flaws. It’s the movie’s intent to take on all at once that works a little against it. The “investigation” plot looks hair brained for a movie that so much rests on intelligence. The script with so many promises and aspirations falters a little here and there but yet remarkably maintains poise, intrigue and fascination with the help of passionate storytelling and some stellar performances, not to forget the quirky music director. There are many moments in the movie that are truly applause worthy. 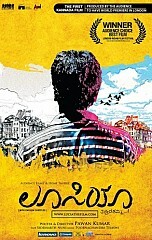 Sathish Neenasam comes out with a wonderful performance. A character that has myriad of emotions is aptly portrayed by him. Be it as a theatre usher or the movie star, he cascades them with flourish. Honest in his expressions and performing within his limitations Sathish makes his presence felt. Achuth in his role as Sankaranna is outstanding. Exuding grace and dignity Achuth gets into the skin of the role quite effortlessly. Shruthi Hariharan as the heroine comes out with a decent performance. The rest of the cast are neat. Lucia is technically quite dazzling. Shot on Canon 5D the cinematographer does a terrific job clearly distinguishing the layers and in the end the output is mind blowing. The music matches up with everything that is the better in the movie. The back ground score is excellent and fits like a glove with the narration. The songs in the movie contribute generously to the mood of the movie with some captivating lyrics. Neat editing and cleverly directed, Lucia holds your attention. Though Lucia is drastic, convoluted and stylishly shot, it doesn’t attempt to overwhelm you with just technical wizardry. The script encapsulates itself with a soul that invariably is found wanting in movies that are supposedly similar in genre. Lucia redeems itself by conveying simple truths that are ignored in the contemporary world and it works not just on your mind but your heart as well. Lucia is thoughtful, enjoyable and a cause to celebrate 100 years of Indian Cinema!!!! Want to know about Santhosh Narayanan's songs in Enakkul Oruvan? This page has information about LUCIA – LUSCIOUS, Lucia, Pawan Kumar.